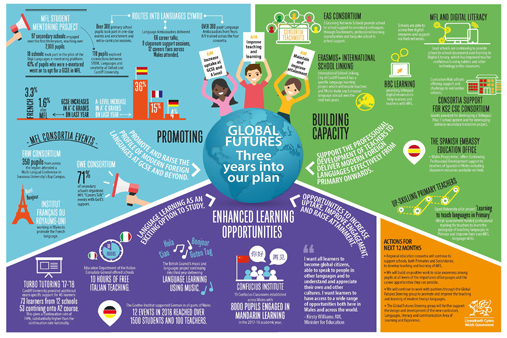 As part of our work as a Pioneer School for Languages, Literacy and Communication for Curriculum for Wales we are working on an exciting project with King’s College London. The aim of the project is to develop pupils’ critical thinking skills through oracy and literature. The feedback from our pupils has been excellent. You may have heard some of them, and members of staff discussing the project on ‘Radio Cymru’. We have now begun on the second part of the project working with our primary feeder schools to develop ‘Let’s Think’ with years 5 abd 6 too. We are delighted to be the first school and now cluster in Wales to develop the project. Our aim is to bridge the teaching and learning strategies used into Welsh and MFL lessons as well as within Literacy Learning across the curriculum. 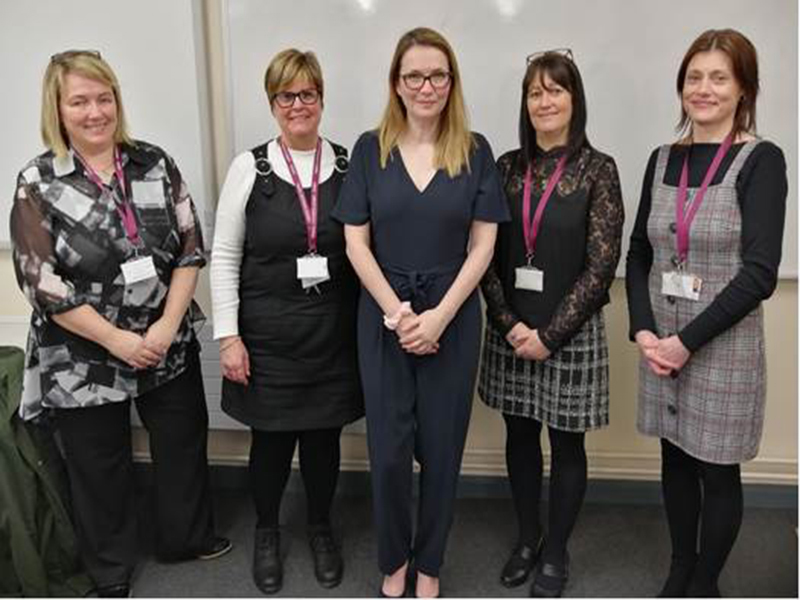 On Thursday the 7th of March, Kirsty Williams visited Ysgol Dyffryn Conwy to meet with cluster heads and our Business Managers team supported by the Small and Rural Schools Grant. During the visit, the Minister learnt about our school to school collaboration around the grant and Curriculum for Wales work. She met with Cluster Heads, Meinir Jones, Karen Lloyd Owen and Nia Jones-Artell; Ysgol Dyffryn Conwy’s Business Manager, Mrs Delyth Williams and the Cluster Business Managers, Tracey Owens, Einir Jones and Sian Owen. 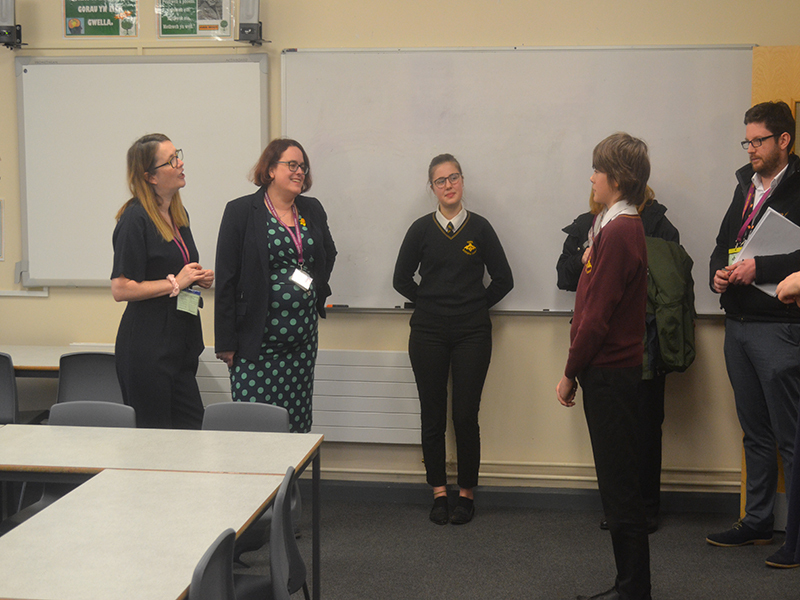 We were delighted that the Minister could visit the school to learn about the impact of the grant in supporting Head Teachers and governing bodies with the business management of school, particularly at times where finance has been challenging. The scheme has seen many benefits including the benefits of joint procurement, scrutiny of School Level Agreements with the local authority and other agencies, and the benefits of releasing Head Teachers in small schools to focus on teaching and learning priorities. The additional benefit has been in closer school to school collaboration, an essential part of cluster working towards national priorities such as Curriculum for Wales and the ALN Transformation Agenda. We are delighted that funding will be available for the next two financial years to support this project. 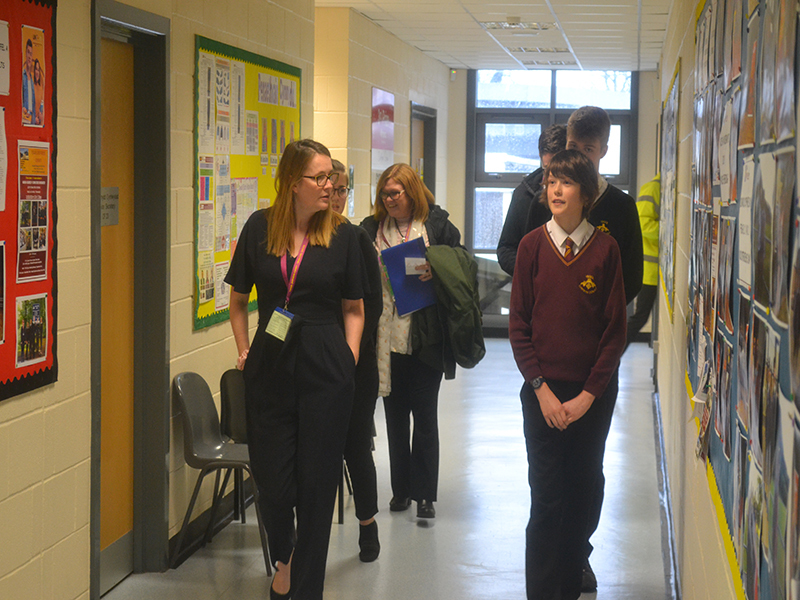 During the visit Kirsty Williams also met our Head pupils, Jake and Efa, and Evan Burgess, Aberconwy representative for the National Youth Parliament. The pupils spoke about their subjects and future ambitions, Evan also questioned the Minister about topical issues such as school funding. As part of a pilot model funded through a 'Small and Rural Schools' grant from Welsh Government, the cluster schools for Dyffryn Conwy and partner small and rural schools have been fortunate to appoint 3 primary Business Managers for the cluster. The primary Business Managers are facilitated through a partnership with Dyffryn Conwy Secondary School's Business Manager and a network of Primary Heads. The cluster has already proven successful in releasing cluster heads from some of the administrative work to focus on teaching and learning. The team have expertise in finance, health and safety and aspects of personnel management. The project is evaluated on a termly basis and the current model is due to run until the end of April 2019.